Everyone knows about Tornado Alley, the area stretching from Minnesota to Texas where such storms are most frequent. But a new study shows that tornado activity over the past 40 years has decreased in Tornado Alley and increased in the Midwest and Southeast, giving rise to hotbeds dubbed Dixie Alley, Hoosier Alley and Carolina Alley. "Although Tornado Alley still remains the top U.S. area for tornadoes, areas to the east are catching up, based on data from 1979 to 2017. That includes portions of Mississippi, Alabama, Arkansas, Missouri, Illinois, Indiana, Tennessee and Kentucky," Doyle Rice reports for USA Today. Those areas are feeling the financial pain of increased storms: "Severe thunderstorms accompanied by tornadoes, hail and damaging winds cause an average of $5.4 billion of damage each year across the United States, and 10 billion-dollar events are no longer uncommon," according to the Northern Illinois University study, which was just published in the journal Climate and Atmospheric Science. The human toll is considerable too. An average of 40 people in the Southeast die each year from tornadoes, Rice reports. More than 70 people nationwide are killed on average from tornadoes, about 10 in Texas, Oklahoma and Kansas. 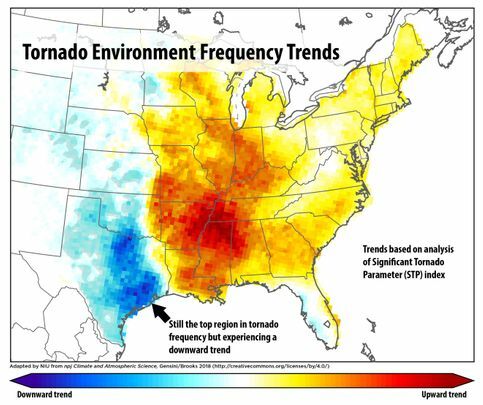 The study predicted that tornado activity will increase, and that a swath of the Mid-South, with Memphis in the center, has the greatest potential for increased tornadoes by the end of the century.